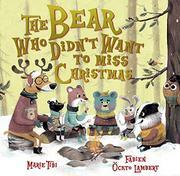 All the woodland animals are looking forward to Christmas except one. After all, Little Bear will be hibernating through Christmas, so “what’s the point” in decorating or writing a letter to Santa, especially since “he’ll go straight past my door without leaving a present?” Little Bear, a small, fuzzy, blue creature with prodigious eyebrows, trudges home alone. Understanding his blues, his friends work together in secret to make him an Almost Christmas celebration. Big Deer takes Little Bear off for a walk while the others prepare his house, and when he sees what they’ve done, he is thrilled. The illustrations in this slight story, a French import with uncredited translation, are stronger than the plotting, which struggles to spread a thin storyline over its 40 pages. But it’s hard not to warm to these cartoony, anthropomorphic critters. In an early double-page spread they sit around a fire toasting marshmallows, Big Deer especially humorous in an ugly sweater with Rudolph on the front and a red hunter’s cap with ear flaps perched between his antlers. And the spread in which Little Bear’s friends greet him holding a “Merry Almost Christmas” banner with identically wide eyes and beaming smiles is hard not to love.